When most people think of Ford’s Theatre, they are reminded of the terrible events of April 14, 1865, when President Lincoln was assassinated here. So you may be surprised to learn that the exuberant image below—featuring First Lady Betty Ford, a former dancer—represents a different side of Ford’s Theatre history. 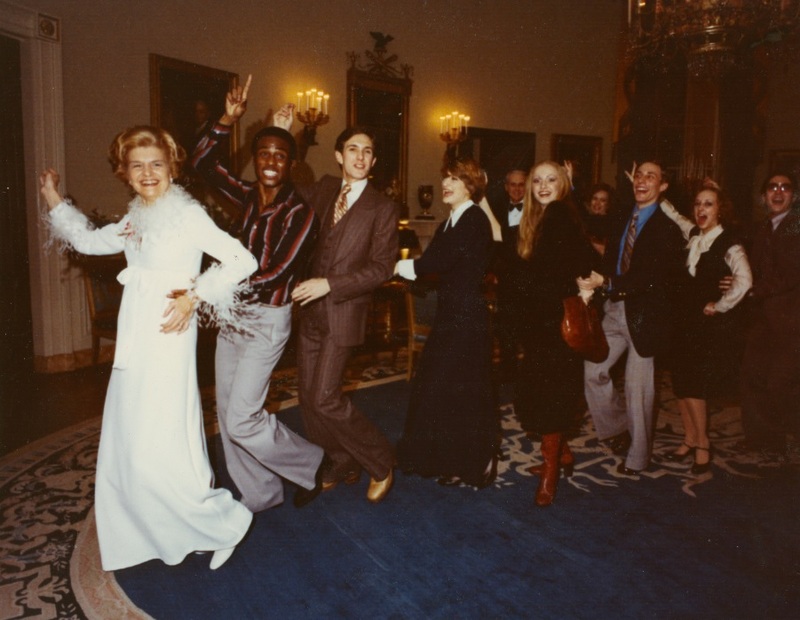 First Lady Betty Ford leads the Ford's Theatre cast of "All Night Strut" in a dance at the White House. Ford's Theatre Society photo. Frankie Hewitt founded Ford’s Theatre Society in 1968 to ensure that vibrant, engaging live performances would return to the restored theatre. It wasn’t part of the National Park Service’s mandate to put on theatrical productions, and it certainly wasn’t their area of expertise, so Hewitt had to look elsewhere for funding. As a well-connected Senate staffer and speechwriter, Hewitt cooked up a brilliant idea. Knowing that Abraham Lincoln is nearly universally admired across political party lines, she imagined that Ford’s Theatre could be a much-needed space for bi-partisanship, where leaders of all political stripes could socialize and build relationships with one another. 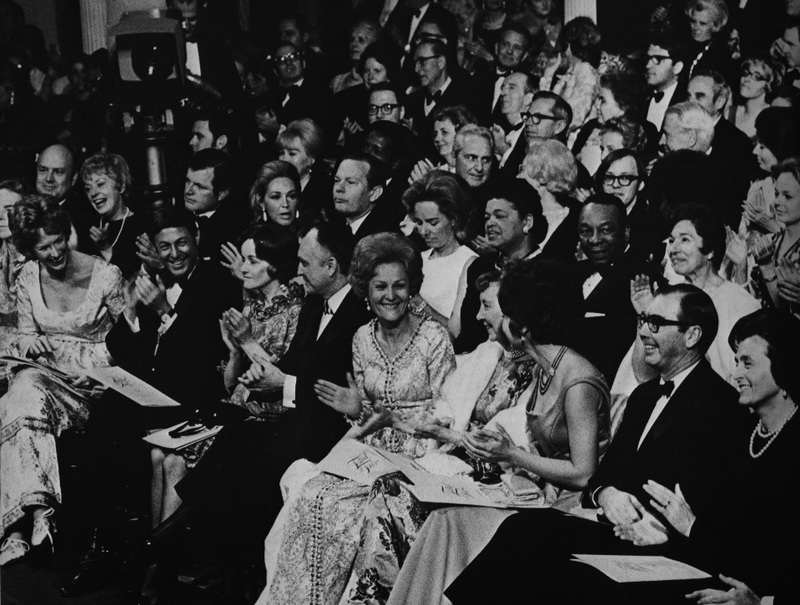 The 1970 Ford's Theatre Gala. Photo from the Frankie Hewitt collection, courtesy Lisa Cassara. And so, the Ford’s Theatre Gala—an annual event that continues to this day—was born. From the first year, 1970, it attracted glamour and power, as well as celebrity. In the photo here, you’ll see not only First Lady Pat Nixon (check out her 1970’s gown! ), but to her left (partially obscured), former first lady Mamie Eisenhower. I also spy both Ted Kennedy and Ethel Kennedy, then-Mayor Walter E. Washington and his wife Dr. Bennetta B. Washington in the second row. Maybe some of you can help us identify more of this swank and social group in the comments. 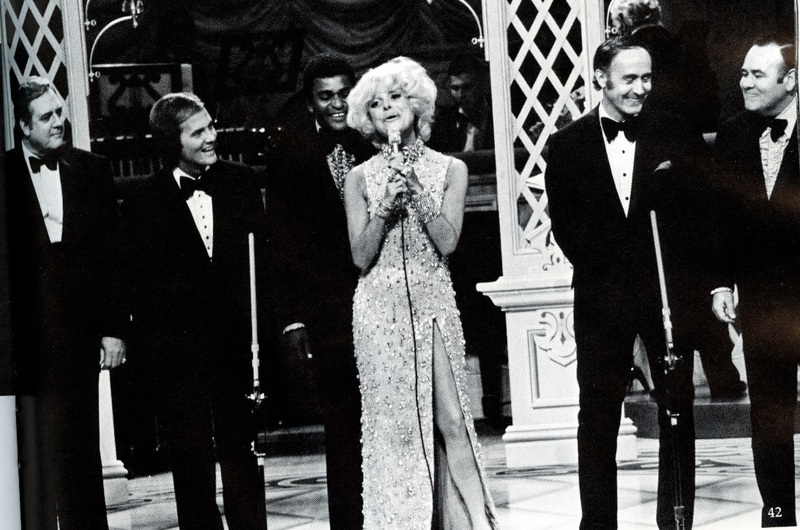 Carol Channing performs at the 1971 gala with Raymond Burr, Pat Boone, Charley Pride, Henry Mancini and Jonathan Winters. Ford's Theatre photo..
Not only was there fame in the audience, but stars sparkled from the stage—and still do, to this day. In this photo you see the truly fabulous Carol Channing at the 1971 gala, crooning away with back-up from Raymond Burr, Pat Boone, Charley Pride, Henry Mancini and Jonathan Winters. For years, the Ford’s Theatre gala was broadcast on ABC Television. Here’s a sample of what it was like—from 1993—hosted by Whoopi Goldberg, and with Jay Leno, William Hurt, Kenny Loggins and Michael Bolton, among others. More recently, we’ve seen Broadway babies like Matthew Morrison, Scott Bakula and Laura Benanti light up the evening, as well as tunes from The Civil Wars, Kelly Clarkson and Lionel Richie. 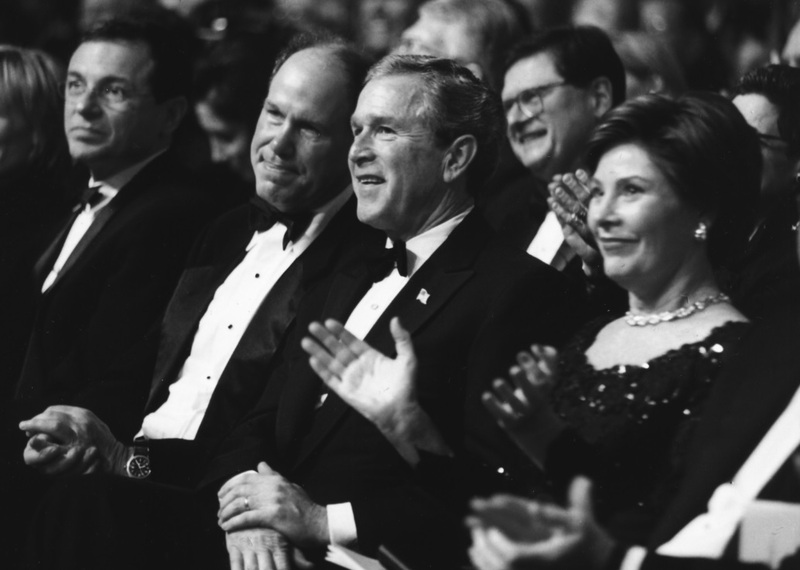 Here are President George W. Bush and First Lady Laura Bush sitting with then-CEO of the Walt Disney Company Michael Eisner, with current chair and CEO Bob Iger pictured on the far left. 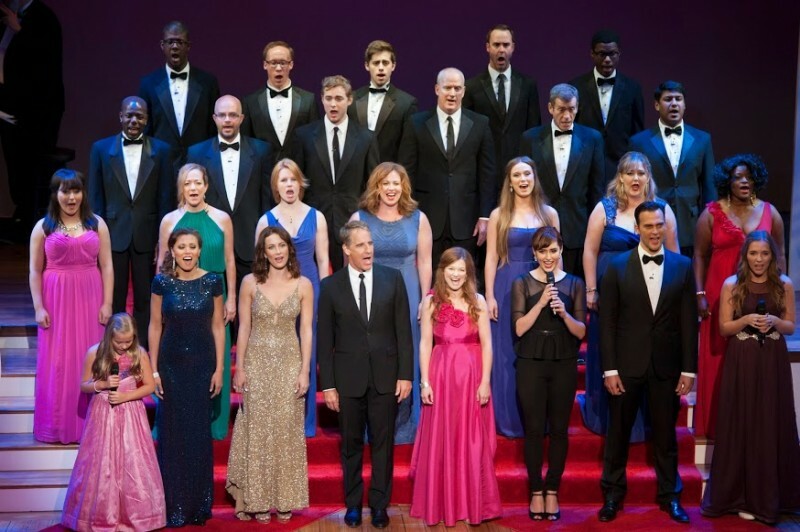 Maisy Stella, Alyson Cambridge, Laura Benanti, Scott Bakula, Melinda Sullivan, Cheyenne Jackson and Lennon Stella perform with the ensemble at the Ford’s Theatre Annual Gala, June 22, 2014. Photo by Margot Schulman. What helps ensure the continued success of Ford’s Theatre Society is that Abraham Lincoln’s near universal appeal is at its heart. An enormous range of celebrities, politicians, business people and arts enthusiasts want to associate themselves with Lincoln, his legacy and his admiration of the arts. It is this very fact that allows Ford’s Theatre to remain a theatre, rather than purely a shrine to a national tragedy. Sarah Jencks is Director of Education and Interpretation at Ford’s Theatre Society. She develops and oversees non-theatrical programs, including those for teachers, students and families, as well as informing interpretation of the site for the general public.